The cusp draws footsteps, hands reaching out ahead to feel the open air where all below is unknown. Here, on the rock face, time stops its sweeping and fire replaces stagnant air. Here, anxiety and anticipation become indiscernible; they face each other in mighty battle. Silly, I don’t give away these things so easily. Not in a blog, anyway. My novel is right. I owe it something for giving me so much–purpose, understanding of self, exploration, a place to vent and weep and feel and love and create and drop my poise, reach for something, give something, move in trance, awaken, fulfill the ego, impress you, impress me, become bigger than the myriad parts that make me up, exist on screen, live on paper, hope for more, become fabulous, exude heat and charisma, receive insight, twist and turn and massage into accurate expression, perceive and be perceived, imagine my face on a slick jacket (what would my eyes say in that picture? ), my name in bold along the seductive spine of the book itself. Yes, little novel…I owe you. What’s the word, what’s up, what doing? What’s news, Wall Street? Gas prices up, no commute partner; heat on the rise, and no A/C. Fair’s gone, carnival leerers have packed up and are on their way to another Great American Community. Kids and dads put their hands back into empty pockets and think of their gains: stuffed teddy bears (5 inches big, polyester, made in China…throw $50 worth of plastic balls into the clown’s mouth and WIN!). It’s summer. Not much to report. 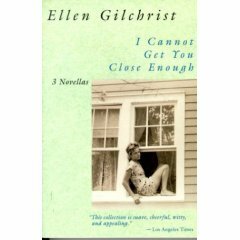 I just finished I Cannot Get You Close Enough, a compilation of three novellas (or mini-novels) by Ellen Gilchrist. I am charmed by this collection of stories because Gilchrist uses some interesting writing tactics here–she doesn’t write in full sentences, she doesn’t fully describe the physicality of the characters, she doesn’t wholly tell a story from beginning to end but instead gives you small glimpses into the lives of her characters. It took a while to get used to this writing style, but I found I enjoyed her writing quite a lot once I got over the strange English usage and stopped the editing/proofreading that comes automatically to me. For those who are writing and are having difficulty grappling with a whole manuscript, pick up this book and check it out. It may give you ideas on how to handle material in a new, refreshing way. Novellas, while smaller in width, can have an impact, be memorable, and let a story shine without being weighed down by stretching itself into a Big Book. So there’s the infamous 50 and 55 words competitions, which I personally loathe because…well, because I don’t succeed at them well. The aim is to write an entire story in 50 or 55 words, usually a twist in the story helps. Here is my recent attempt. Try it–you’ll despise love it, too! A little story II (before I). Okay, now. What did you expect her to do? Her next therapy session wasn’t for several days, so who could she talk to? I mean, really, a girl like that will light into fire if she doesn’t get it out. She’s constitutionally unable to play it cool. So, first she tried to talk to God. Are you there God, it’s me, Sad Sack. But the hurt spilled over and she didn’t think she’d earned the right to ask for comfort. Because (and here’s the irony!) she’d created the hurt. Engineered it. At lunch, her longtime good girlfriend listened for a while, shaking her head and wondering aloud what satisfactory outcome “could you possibly have imagined?” She prescribed a big glass of wine and steered the conversation away, quickly. I think we all know that her friend found the whole thing distasteful and what she really wanted was to catch up and relax…this talk (full of surprises and uncomfortable insights) wasn’t what she’d come all the way downtown for. No. So what does that leave? Well, let’s see. Father Confessor? No. Boss lady? Uh, no. Playdate mom? Negative. Neighbor? Get serious. I think that leaves one person. But that one person is it. The issue. The crux. Countdown to therapy, in 4-3-2-1…and on and on.